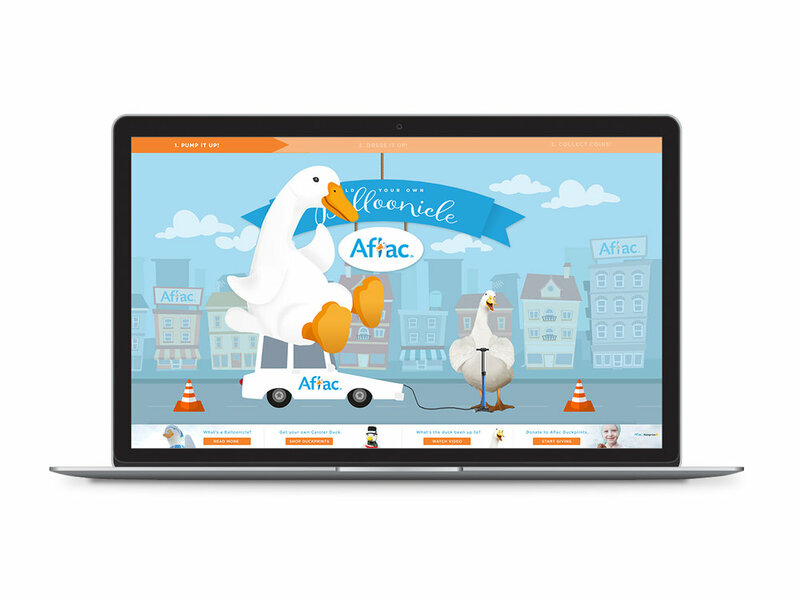 Aflac has many initiatives outside the world of supplemental insurance. But perhaps its most important is the work it does to raise money and awareness for childhood cancer research. And every Thanksgiving, they take a stand for this cause in a big, fun way. Aflac is one of three corporations worldwide to drive a Balloonicle down the Macy’s Thanksgiving Day Parade route. What is a Balloonicle, you ask? It’s not like the traditional balloon, tethered to the ground and carried by volunteers. It’s a parade balloon built on top of a four-wheeled vehicle, giving it the entirely ownable portmanteau “Balloonicle.” To enterprise on this unique brand experience as well as raise additional funds for its non-profit sector Duckprints, Aflac reached out to my team to create a Balloonicle-themed interactive experience, destined to go live and build engagement prior to the 2016 Macy’s Thanksgiving Day Parade. My team and I created an interactive experience that allowed users to interact with the Aflac Balloonicle in three stages. The first, “Pump it Up,” featured a mini-game where users must pump up their Balloonicle with the help of the Aflac duck. By clicking as quickly as they can, the balloon breathes to life and passes onto the second stage of the experience. In this final phase, users can direct their Balloonicle down the parade route, collecting money for cancer research. The parade route is decorated with callouts to Aflac and Macy's, including the iconic, red and yellow Macy's star balloons. Children’s HealthCare of Atlanta's Aflac Childhood Cancer and Blood Disorders Center is the final stop on the parade route, where your Balloonicle screeches to a halt to deliver all coins collected during the game to the center, the real-life recipient of all Duckprints funds. At this point, the game experience is over, but the social experience has just begun. The user is presented with their final coin count and an end-game prompt with several options. From here, users can play again, shop Duckprints (and buy a stuffed version of the Balloonicle), or donate $2 just by sharing the experience via Facebook or Twitter. Overall engagement, clickthrough to replay, and click-to-donate were all metrics our client team aimed for, and all three exceeded expectations during the life of the Balloonicle experience. If you'd like to learn more about the process of making this project, click here to download documentation of my process from ideation to sketching, and taking these ideas from design to production.